Over a month ago I read my first book written by Brandon Sanderson. I’ve been aware of his writing ever since it was announced that he would complete Robert Jordan’s The Wheel of Time series. I have only read the prequel and part of the first novel when the news came out of Jordan’s passing but I followed the news surrounding the continuation of the series because my father was a big fan of the series. I’ve been aware of Sanderson’s work for several years but due to school and commitment to my growing obsession with comics, I haven’t read anything of him until I found Warbreaker at my local used bookstore. That’s also where I found The Emperor’s Soul. Having read only two books by Sanderson, one novel and one novella, it’s interesting that a clear idea is forming of just what kind of writer Sanderson is. It’s also becoming more obvious why there is a growing Cult of Sanderson in the work of fantasy fiction. I’m not yet ready to join the cult, but the more I read his work the more I want to read the rest of his books. One of the reasons I decided to give The Wheel of Time a second chance aside from having enjoyed the prequel and wanting to read the series anyway, is that I have read and been told several times that Sanderson’s final three novels of the series as better that some of Jordan’s own books in the series. What? Isn’t that kind of blasphemous? It might be but there is only one way for me to find out and that’s to read the entire series. Though I’d like to point out that I think Sanderson is a very different kind of writer than Jordan so I’m actually more interested in seeing how or if his Wheel of Time novels differ from his other novels. I’m losing focus, this is supposed to be a review of The Emperor’s Soul. 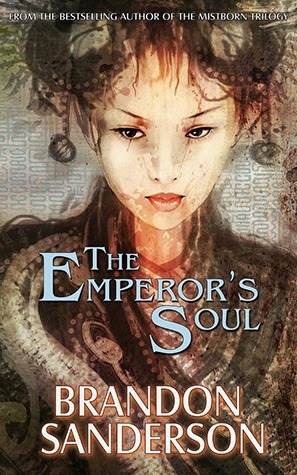 The Emperor’s Soul is by far the best short piece I’ve ever written, and it rivals the best of my novels in quality. It is the perfect piece to win [Sanderson’s first Hugo award], one I’m exceptionally proud of. I’m amazed, gratified, honoured [sic], and deeply grateful that so many people found it worthy. This is the perfect news to use as the first post on my new website, which you may have noticed has finally come online. I’m extremely proud of this novella. I think it’s my best piece of short fiction to date, and stands as one of the best complete works I’ve done of any length. It reads more like a short novel than it does a long short story, and does a lot of what I do in my longer fiction—it has a great magic system and cool characters. So what is The Emperor’s Soul? It takes place in the same world as Elantris, though in a very different region, with only a few ties to Elantris. So you definitely don’t have to have read Elantris to appreciate it. (Though if you have, you should be able to see some fun ties between the magic systems.) It tells the story of a woman named Shai, a thief and a Forger—a person capable of rewriting the pasts of objects in order to change their present. The plot is simple, as it should be for a shorter work. The Emperor has barely survived an assassination attempt and, as a result, his mind has been severely damaged. The Arbiters (bureaucrats and advisers to the Emperor) make a deal with a thief they’ve recently capture. The deal is to create a new mind for the Emperor, using only his journals as a source of information. This might sound ludicrous but the person which whom they make the deal is a young woman named Shai. She is a Forger and her impressive mastery of deception and Forging make her the only person capable of doing this task. To further complicate things, Shai only has 100 days to Forge a new soul for the Emperor. The Arbiters are using the excuse that the Emperor is mourning his wife who died during the assassination attempt. The official mourning period for such a loss is of 100 days. The real focus here is the magic system. Based on what I’ve read of his so far, he thinks of his magic in a scientific way. There are clear rules to how it works and any magic related surprises are clearly established in his description of how magic works earlier in his stories. Due to its length, the main focus of The Emperor’s Soul is the magic system and descriptions of how it works, everything else is secondary. The magic system in question is called Forging. It’s a form of magic that revolves around making copies of objects that so closely resemble the originals that it’s impossible for most people to tell that they are a forgery. The magic is done by studying the object along with its attributes and creating a soulstamp. The stamp is how the Forger commands the object to change to resemble the object that the Forger is replicating. The soulstamp also serves as a way of rewriting the objects history. The more history that is provided, and the more believable that history, the greater the chance that the magic will work. There are numerous other nuances to Forging and Sanderson writes several scenes in the book to elaborate on those nuances. Early in the story, Gaotano, one of the senior Arbiters, comments that Shai could have escaped her imprisonment by Forgins her shackles into soap and breaking free. That could easily have been an offhand comment with little consequence to the reader or the story. Instead, Sanderson uses this as a jumping off point to provide information on how Forging works by having Shai explain it in her thoughts. Characters, in their actions and in their words, are being used to first explain and then demonstrate to the reader how the magic system in this story works. The shackles couldn’t get turned into soap because it’s illogical. Who would turn soap into the shape of shackles? If Shai rewrote the history of the shackles so that they would have been made of soap, the transformation to soap wouldn’t have stuck. The shackles would have reverted back to metal because the history of why it’s soap isn’t convincing enough for the magic to work. Sanderson’s magic systems aren’t single step magic. They are complex and require many steps. Characters need to understand the multiple components and actions required in order to do magic. More importantly, the reader needs to understand the rules of how the magic work in order to understand the story and the motivations of the magic user. That requires a lot of preparation work by Sanderson and its spread out through the entire story. A lot of Shai’s Forging during the book doesn't have much to do with her primary task of creating a new soul for the Emperor. Sanderson has her Forge many different things throughout the story to give him the opportunity to explain the fundamentals of Forging to the reader. It all serves to setup for the end of the story. I found it interesting how Sanderson manages to inform the reader of how the magic system works in both Warbreaker and The Emperor’s Soul. It was a smoother process in Warbreaker because there is more story going on, it’s not just about magic. The same cannot be said about The Emperor’s Soul which is all about Forging, how it works, how it affects people and, the most unexpected, how it relates to Art (yes, with a capital A). What is it? What does it mean to the public and what does it mean to the artist? Is art created by Forging something that is functional and practical? Or is it something that effectively mimics the original object being forged? Maybe at is when the Forger is able to make a copy that improves on the original or maybe it’s something that only truly comes to life when the object is something that can be recognized as something of great value by others. I’ve been very clear about how few books I’ve read that are written by Brandon Sanderson but Forging strikes me as a significantly more artistic type of magic than something like BioChroma (from Warbreaker). From understanding the object (or subject, if you’re Forging a soul) to the creation of soulstamps, there is a lot of analysing, crafting and technique involved in making it work. Some of the above might sound like I didn’t particularly enjoy The Emperor’s Soul. On the contrary, I thought it was a great fantasy novella. Yes, it’s too clean and precise and the plotting is too focused on magic. One of the things I really liked about Warbreaker was the characters. Not all of them, but some of them, particularly Lightsong, really worked for me. I’m very impressed by Sanderson’s ability to write creative, or at the very least engaging ways of providing exposition. Because of the heavy focus on intricate, science-like magic systems, a lot of exposition is required to help the reader first understand and then appreciate the magic system that has been developed. For those diehard Sanderson fans, keep your eyes open for the world hopping character from Sanderson’s Cosmere. I think it’s the Emperor’s Fool in this book but I might be wrong. My main criticism for The Emperor’s Soul is that the magic is more developed than the characters. I also didn’t like that Shai is essentially a perfect character. She knows everything, cannot be outwitted and regularly does the impossible in the short length of this book. Add that to the fact that the book is predictable and wraps up too cleanly, the book lacks nuance. Despite of all that, The Emperor’s Soul is very, very good. If the problems I mentioned were found in a 600 page novel, it would have been difficult to forgive but for a 170 page novella, it’s a nice shotgun blast of a story and it’ll scratch that itch to read about an original and complex magic system. You can’t fault an author for writing a shorter work with a really tight focus and that’s what this book is. Just be careful when buying it because your head might be spinning from the sticker shock. I bought my copy for $7.95 at a used bookstore but the cover price on the back on my edition is $14.95! It might be worth it for Sanderson fans, but for newcomers I would give one of his longer works a try first. They’ll likely be more substantial and less expensive.